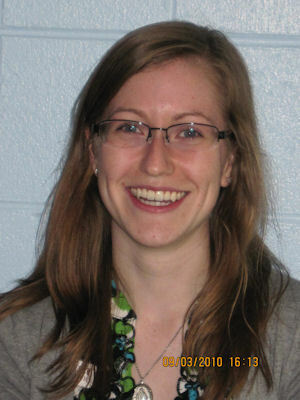 Meet Your Neighbor Rachel Pepich, new staff member at West Central High School. Rachel lives in Monmouth but was born and raised in Burbank. She teaches Algebra I and II and is an "After School" math tutor at West Central. In 2006 she graduated from Reavis High School and in 2010 she graduated with a BS in Math Education from Illinois State University in Normal. Her parents are Paul and Janet Pepich. Both are employed as physical therapists in Chicago. Rachel's brother, Matt, is an engineer with a national defense company in Rolling Meadows and her sister, Allison, is presently applying to Veterinary School at the University of Illinois in Champaign. She studied in Australia for 4 1/2 months in 2008. While she was in Australia she climbed Mt. Warning which was featured in the movie "Fern Gully". Rachel plays the saxophone in her spare time, crochets for friends and herself . She laughed as she said, "I crochet ugly looking scarves." She also loves spending time in the kitchen. When asked what she liked about being a new staff member at West Central she said, "The staff and administration at West Central are very supportive and interested in making sure I am successful. I am also starting to make good relationships with the students. They are inspiring me in my first year of teaching."